Maior autem his est caritas: "I am so tired of you liberal church in America"
"I am so tired of you liberal church in America"
"For thirty, forty, fifty years I have resisted to the best of my powers the spirit of liberalism in religion." Twenty five years ago, the Lord Jesus changed my life, when He revealed Himself to me on Good Friday. I started going to Mass every Sunday after that. I longed for the Eucharist. I remember trying to explain the Eucharist (and failing miserably) to my father, when he asked me why I needed to become Christian, "to join their club," when I could so easily just follow Jesus' teachings, and worship Him, as a Hindu. As I expressed my desire to become Christian, I was told that baptism was not necessary. That some lived as "Hindu Catholics." That evangelization meant that the Church wanted everyone to be better in their own religion, not that they become Catholic. In a parish Scripture study class which I attended during what was (effectively. It didn't exist in actuality as an organized process) my catechumenate year, the Jesuit transitional deacon taught from the texts of the Jesus Seminar, demythologizing and deconstructing left, right and center. I saw the scandal on the face of the old ladies who attended. I remember thinking quite explicitly, "If this sh*t is true, why bother with the Scriptures? Why bother with the Church? With anything?" After a parish youth meeting, another Jesuit transitional deacon explained that there were various interpretations of the priesthood: the traditional one focused only on cultic aspects; however, now more prophetic aspects were being emphasized. The implication was that the traditional perspective was outdated. Inadequate. Superseded. Jesus came to liberate the poor, and this meant denouncing structural sin, and criticizing capitalism and the West. This was all that morality was about. Structural sin. Personal sin was passé. Liberation theology was in. My best friend -- a devout, faithful Catholic, who was a huge influence on my life, and in my conversion -- gave me some books to read that his Jesuit mentors had given him. They were by Fr. Anthony De Mello SJ. One contained various parables and aphorisms, from a variety of religious backgrounds. The thrust of them was clear -- dogma and doctrine only confine, and distort. What is important is a true mystical experience of the Divine (however understood), and a transformation of consciousness. The Church had forgotten this, and only now (thanks of course to courageous prophets such as Fr. de Mello) was coming to realize her true mission. Furthermore, all religions were essentially the same, and lead to the same goal. Fr. de Mello, before his sudden death of a heart attack, seemed to suggest in his last book that he had embraced the Buddhist path of detachment. I recall a conversation with a lovely religious sister, on a service day with the parish youth group. We were going to spend the day at a school for handicapped children. She said, flatly, that the Pope was wrong, that women would eventually be ordained, and his teaching was only his opinion. During my catechumenate year, my catechism was the Dutch Catechism of the 1960s, along with Fr. Richard McBrien's "Catholicism." To his credit, the wonderful Dutch priest who catechized me, insisted that I read Humanae Vitae, a text which absolutely scandalized me. Family planning was presented to us as a national virtue! The overcrowding and overpopulation myth was still reigning. "Hum do, hamare do," proclaimed advertisements and billboards everywhere. "Us two, our two," referring to ideal family size. At one Mass celebrated at my college, the priest wore a saffron shawl, like a Hindu Brahmin priest, instead of a chasuble. The Eucharistic prayer used texts from the Hindu Vedas, even using Vedic language to refer to God as "being-consciousness-bliss" (sat-chit-ananda), while women performed an aarti in front of the altar at the Offertory. No one, in my entire time (four years) of getting to know the Church, and Catholic life, taught me how to pray. No one, in my entire time of getting to know the Church, mentioned the call to holiness. Few, truly mentioned, or focused on, the figure and person of Jesus Christ. This was all in India. Prior to my baptism. This was the liberal church in India that I had encountered, that, paradoxically, in the Lord's mysterious ways, was also the instrument of the encounter with Him. I always say that I became a Christian despite the best efforts of the Jesuits. It is said jokingly, but only in part. Of course, it was not all heresy and dissent. There was much laughter, discovery, camaraderie, and true friendship. I am immensely grateful, because the Lord uses everything. Everything. But, especially clear in hindsight, it was truly only His mercy that preserved the tiny seed of faith from being completely choked by thorns in later years. A huge part of the tale of this movement to orthodoxy were the writings of Joseph Ratzinger. Another was John Paul II's Theology of the Body. One small, but significant part, was a bible study written by Dr. Scott Hahn. And several folks whom the Lord put in my path, who lived joyful, fully Catholic lives. Now the story isn't that I stumbled across EWTN and was converted. I cannot recall, actually, the first time that I saw a program on EWTN. It was more what Mother Angelica and this incredible, odds-defying network managed to do. It created a space within American Catholicism, for a vibrant and joyful orthodoxy to take root and blossom and flourish. People were no longer alone, no longer beholden to the tyranny of parish DREs and pastors, diocesan media, publications, and liturgy offices. And with the arrival of the Internet, EWTN's vast online archives -- of Church documents, teachings, homilies and forums -- offered an immediate resource, orthodox and faithful to the Magisterium, to an innumerable number of Catholics and those interested in Catholicism. The small but vibrant and dynamic revival of Catholic life that is underway in the United States -- and it most certainly is. For instance see, in no particular order, these amazing apostolates and groups: FOCUS. And The Nashville Dominicans. And Dirty Vagabond Ministries. And Juventetum. And A Simple House. There could be so many more! -- has so much do with this incredible, spunky, cloistered Franciscan nun. Eventually I discovered this revival, and first hesitatingly, and then joyfully, dove in. With this autobiography as background and context, you can imagine how powerful it was to watch this video, which came across my Facebook newsfeed the day after Mother's death. It is from 1993, during Pope St. John Paul II's visit to World Youth Day in Denver. Mother is incensed that at a mimed Stations of the Cross, a woman played the part of Jesus. And what follows is this epic rant, this classic polemic. It is well worth a watch. Her anger, her righteous indignation, her fire, her zeal, are so palpable. I had never seen it until today. I wish I had seen it earlier. I wish I had discovered the true faith earlier. I wish I had discovered orthodoxy earlier! But all things happen in the Lord's time, in His Providence. She certainly received pushback for this speech. She didn't back down. (Her response to one Bishop is as memorable as it is characteristic of her grit, and her determination.) Her cry resounded and reverberated across the Church. A crusade for orthodoxy had been launched, within the heart of the Church in the United States. Thank you Lord, for the gift to the Church that was the life of Mother Angelica! Always you raise up women and men, in ways most unexpected, from among the poor, the lowly, and not the mighty and lofty (indeed, from the peripheries! ), in answer to the challenges of the age. Truly, you confound the wise of the world! We pray for her as she faces her particular judgment (a dreadful moment for all, which we must keep ever in front of our minds). We pray too that she might, in accordance with your will, be raised up to the altars, as a model for holiness for all the faithful. And you, liberal church in America! Your heyday is over. Your stranglehold is, thankfully, broken. In the twenty-three years since Mother spoke these words, new life has sprung up across the Church. Despite your efforts. Despite your contempt. In the face of your clear bewilderment and fear, the young who stay with the Church, fall in love with her, her traditions, her teaching, her Lord, and embrace orthodoxy. There are still dying gasps from your aging, collapsing strongholds. There are still places where you cling to power and wield it in a most unyielding, authoritarian manner, all in the name of "compassion." Your attempt to claim our present Holy Father for your tired, decrepit agenda of "reform" is almost amusing, if it were not for the tragic and colossal amount of spiritual damage caused by your sterile, dry, barren vision of ecclesial life. Mother was tired of you then. Your own tiredness is evident now. An exhausted project, as a great son of the Church once put it. Pray, go out quietly. Leave those of us who want to live a truly Catholic life, in peace. You have had your day. You have sown devastation and destruction. You have reaped the whirlwind. Rest in peace, Mother! May the angels lead you to paradise! I have had some experience with Mother Angelica via a cousin of mine who spent several years as a professed brother and seminarian under their auspices. It's a long story, but suffice it to say that it didn't work out for him. There are different paths to the same goal. And yes, indeed, there are many paths. The Church is a huge and vast arena, and incredibly rich and diverse. However no path should go beyond the boundaries set by orthodoxy. That would be wrong. And stupid. It would be like walking off a cliff. And it would miss the goal. Entirely. Is the OF orthodox or at least "within the boundaries set by orthodoxy". Because if it isn't lots of bishops and the current Pope are wrong. And stupid. I know you want to make your point strongly, but might be a bit of an overreach. I'm scratching my head now. I said nothing about the OF or the EF in the post. Where on earth did you get the idea that I think that the OF is unorthodox? That is how I offer Holy Mass most of the time, the vast majority of the time. Do me the courtesy of explaining my supposed overreach. True, you said nothing about the OF and EF, but like I said, I've been to Irondale, AL a couple of times, and the first time circa 1995 I thought I had traveled back in time to 1955. Mother Angelica had a definite opinion. I suppose I was analogizing that and placing it on you. I apologize. 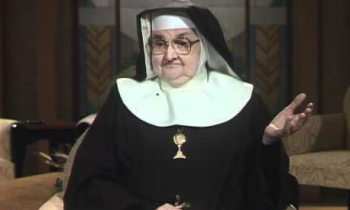 Mother Angelica was hardly a sedevacantist, or a Lefebvrite. I've been to the Shrine. The Mass is offered normally in the OF. It may have more Latin than your average parish Mass (that is hardly a difficult achievement), more chant (ditto), and is offered ad orientem (it's versus populum that is the innovation, with no basis anywhere in the Council documents, or the liturgical tradition of any Rite. The arguments for an appeal to some distant antique practice have been effectively demolished in recent years. There's a whole another set of problems with selective liturgical archeologism anyway ...) ... but to suggest that it was in anyway unorthodox is, simply, well, wild! On the network itself, the Mass is regularly in the vernacular, and versus populum. So if that's the basis of your contention, I don't find any evidence for it in fact. If I may, I suspect you equate (any?) love for traditional forms, (any?) suggestion of incorporation of Latin in the Mass, for any suggestion of the merits of ad orientem as simply "turning back the clock" and an abandonment of the reform, and therefore, an abandonment of the Council, and, it would seem based on this exchange, a leaning towards heterodoxy, if not actual heterodoxy. Meanwhile, check out this 60 Minutes interview with Mother from 1984. You'll see her, and her nuns, playing guitars, drums, and even singing, if I'm not mistaken, Here I am Lord.